Our trailer is now on YouTube! A fish out of water nerd love story. 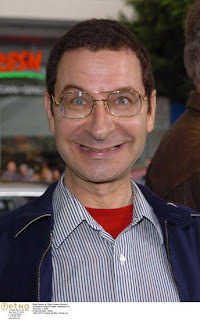 I Love You, Eddie Deezen! Deezen -- Yup, an Eddie Deezen look-a-like band! Principal photography was May 17-20. We wrapped late Sunday night (Monday morning, really) and we would like to thank our excellent cast and crew for working so hard and being absolutely amazing. The dailies look great so far. On to editing and sound. We expect to have a premiere late summer. Because nerds need love, too. YOU ARE MY TRUE LOVE. I LOVE YOU, EDDIE DEEZEN!!!!!!!!!!!!!!!! Jay O'Balles -- Prod. Asst. Sherry Mattson is set to direct for the first time. Signatory paperwork has been filed with the newly merged SAG-AFTRA guild. We are shooting the last two weekends of this month and pre-production is going along surprisingly smoothly. Damon Standifer is now to play the role of Stanley. TJ Maidel will compose an original music score for our film. Makeup artists from Cinema Makeup School are on board. Locations locked down! Almost done casting. Stay tuned for complete cast list on our SAG Short Film! Mattson Productions welcomes co-producer Corinne Spicer. Corinne Spicer was born in Joplin, Missouri to a family of car dealers. As a kid she learned she could talk people into doing just about anything, just like Tom Sawyer could convince the kids to do his chores. Instead of yard work, however, she talked the neighborhood kids to re-enact her favorite TV shows or got them to act in one of the plays she wrote/produced/directed and starred in making her mother watch it all. Being ahead of her time Corinne used skills of improvisation and making the audience part of the show, stuff she didn't learn about until later in life. It finally occurred to her one day that she needed to be in a bigger city and move away from her small town in the Ozark Mountains, she was 4 at the time. At the age of 9 she wrote her plan to go to college in Boston and then move to Los Angeles. At 18 she got on a plane to Boston and at 22 she graduated from Emerson College with a Bachelor of Fine Arts. After graduating she settled in Los Angeles where she has been working every since. Corinne has had jobs in all kinds of fields in the entertainment industry. She's been in casting, worked as a voice over session runner, as an assistant director, actor and producer. If it's in front of a camera, behind a camera, in a sound booth or on a stage as long as she's being creative, she's happy. She now takes her can do attitude and talks others into working on real film productions having several films she's collaborated on going the festival circuit with many more to come. Yes, it's official! Our script was registered yesterday with The Writers Guild of America, Los Angeles office. We are set to shoot in May 2012. The cast and crew are coming together nicely, and we have our locations. Eddie has agreed to make red carpet appearances at the film's premiere in Los Angeles as well as film festivals. More news to come... stay tuned! Mattson Productions welcomes director AK Hottman. AK Hottman was born & raised in the great state of Colorado. It was here that he was first introduced to filmmaking; exploring the beautiful world around him and the creatures that inhabit it. On New Years Day 2010, after graduating with a BFA in Film Production from the University of Colorado, he moved to Los Angeles to continue his pursuit as a storyteller at the University of Southern California's School of Cinematic Arts MFA Production program, where he is focusing on directing. He has directed various short films including The Sacrifice of Old San Juan and The Wilderness, a handful of spec commercials including a popular Dorito's spot entitled Paint-Fight and has worked on several feature films including Transformers 3: Dark of the Moon and the Academy Award winning animated film Rango.